Divide the inside zone from the external one. With the help of the machine adjusted on 9 mm., cut the excessive length in the external zone. Go over the same area with the machine more times, so that to be sure not to leave undesirably lengths. 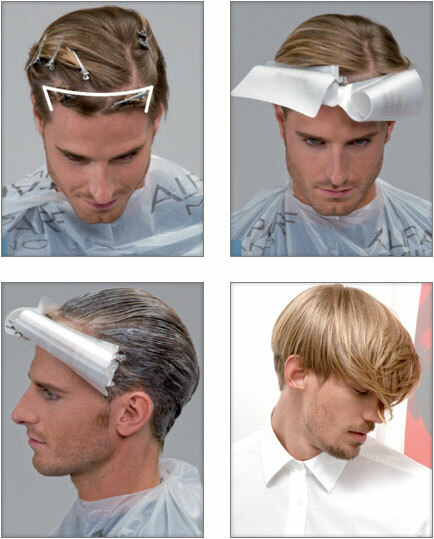 Keep the hair with the comb, clean properly the transition line of the graduation. With the help of the machine adjusted on 6 mm. and the shade technique, clean properly on both sides of the whiskers area, the ears, the side hairlines and the low nape. With comb and scissors refine carefully the whiskers area, around the ears and all the hairlines. Work in the internal zone. Draw a central section profile of about 1-1,5 cm., raise the section at 90°, take as reference the graduation previously made and cut the excessive length with a light front diagonal, that is from the short to the long in order to obtain greater length on the front hairlines. Go on with the profile sections, take them basis-on basis and cut the hair with the same technique for the whole internal area. The reference will be the previously made shade and the profile section cut before. then clear away corners possibly created in the shape. Go on with the same technique starting from the right side and finishing to the left one. Through the crossing check and vertical sections, clear away possible excess in length. Use the same technique for the whole internal zone. Divide the top at zig-zag. Cut with smooth blade on comb. Go on the back side, leaving length in the central area of the linking zone. Cut the graduation zone to extend in the intermediate link with a reference length of 3 cm. Cut the top starting from the intermediate linking zone with scissors tip technique. Starting from the temples, draw two horizontal lines finishing at about 2 cm.behind the ear. Go on drawing a line linking the previous ones close to the occipital bone, in this way the upper panel B and the lower one A, will be delimited. Panel A: comb from the low towards the high and cut vertically to the shoulders maintaining a length of about 2 cm. Go on with the same technique in the whole panel without creating any shade or graduation. Panel B: comb the hair of the whole panel from the right side and cut close the ear following the line of the previous division. 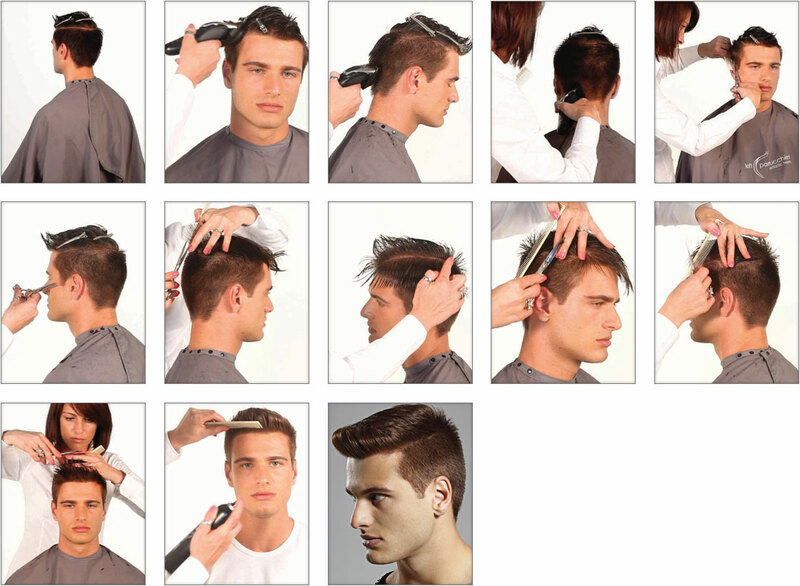 Repeat the operation by combing the hair on the opposite side. Starting from the central front section draw some triangle sections beginning in the pivot, creating a light shade. Create a rectangle of 2 cm thick, in the frontal part finishing at the temples height. Apply Supermeches+ no ammonia mixed with Oxid’o 20 volumes. Give tone with Color Wear 9.21. At last apply on the whole hair Color Wear 8.12.